You may even think that you need to avoid exercise. This is a mistake – everyone needs exercise, and you simply need to know the best exercise for asthma patients. Before you start seeking out various exercises or activities that you can participate in, it is vital that you learn how to manage your asthma, and get it under control first. You should work with your doctor on this. He or she should prescribe medications that will help a great deal, and you may be advised to avoid certain foods and other triggers. Additionally, your doctor should prescribe you an emergency inhaler, which should be with you at all times – especially when you are participating in physical activity. Your doctor may even suggest that you use an inhaler right before you start doing any type of physical activity to prevent an attack. Once your asthma is well controlled, you are ready to start getting some exercise. The best types of exercises for people who have asthma are the ones that have periods of activity and periods of rest. One example of this is baseball or volleyball. Exercises or activities that involve constant exertion are not always ideal for people who have asthma. One exception to this rule, however, is swimming. Swimming usually isn’t a problem for people who have asthma because of the moist environment – especially in a heated pool, or outdoors on a warm day. 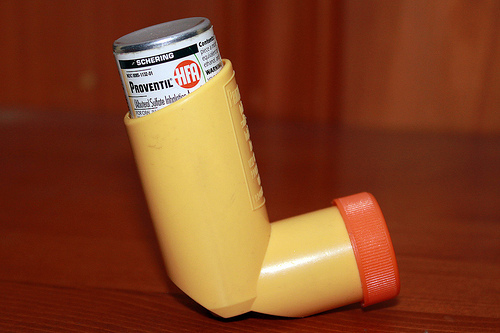 As an asthma patient, you are not free to just start exercising without a bit of planning. For example, you need to warm up, and cool down after physical activity. You may need to take time to use your inhaler before activity. If you are outdoor in cold weather, and exerting yourself, this could easily lead to an asthma attack, so you may need to wear a mask. There may be other factors that apply to your specific case, and other specific precautions that you need to take based on that. Be sure to discuss exercise and physical activity with your doctor first.